Allprint started out as a family-run screen printer 25 years ago, and gradually moved into digital print. The company has always had a strategy which, over the years, has seen it adapting to the market and investing for the future. “We needed a new printer to work in particular on our high end retail POS jobs where the images have to be of a very high quality – for example, backlit installations for cosmetics companies. “We looked at several options and chose the H2000 as we were very happy with our other two VUTEk printers and knew the quality we would be getting. The installation process and training was also first class from both EFI and CMYUK. “The H2000 ticks a lot of boxes for us, with the greyscale technology specifically being a big plus as the image quality is as good if not better than that we have seen on any printer, and the production speeds mean we can take on more demanding jobs. “The impact has been amazing in the three months the printer has been installed; we have already completed several large orders that we would not have been able to produce before. “Existing clients have also commented on the image quality that the H2000 produces, which has led to further opportunities. Lead times have also been cut as this machine is three times quicker than our previous flatbed. 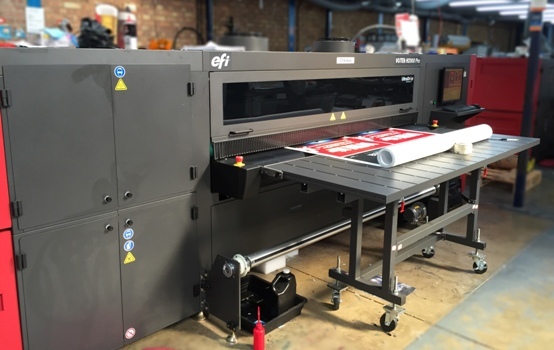 Robin East, Director at CMYUK added: “The six-colour H2000 with UltraDrop Technology is perfect for the high end work that Allprint want it to focus on. “Ever since the first investment in a flatbed digital press the original company has grown and has changed completely. Screen print has gone and we are now just purely digital, servicing clients up and down the country as well as locally. Even though the company has grown we still hold the same values of service and quality. For more information, visit www.cmyuk.com, or go to www.allprintdisplay.co.uk or call 0044 (0) 1604 648685.